A few years ago when I used to grind the micro stakes like crazy playing 24 tables at a time and 200k hands a month, it was all about the quantity over the quality. Your winrates are never going to be great when you play this many tables and put in this many hands. But since I was mostly playing NL25, NL50 and a bit of NL100 on Stars with Supernova, I was making some pretty decent money each month with rakeback alone. The problem was that my table winnings weren't that impressive. I was only managing about 3bb/100. And while I knew that I could only do so well playing this much volume (there is an undeniable ceiling on your winrate when 24 tabling), I still felt I could do a lot better. After all, I have always prided myself on not only beating the games but crushing them for the highest winrates possible. One day I made a very simple discovery though. And it allowed me to make $800 more from online poker every single month. Here's how I went about it. First things first I opened up Pokertracker and I filtered for every pot that I played in the past month of any significant value. 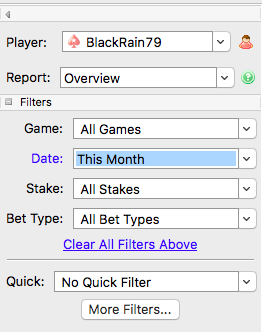 Lastly, in order to filter for pots of a certain size (I would typically choose 30 big blinds or more), you just click on the More Filters... button. 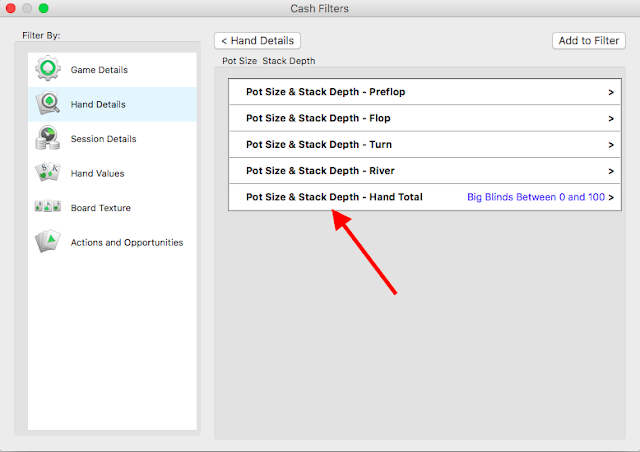 Choose "Hand Details" as you see above and then select "Pot Size and Stack Depth - Hand Total" in order to filter for final pot sizes of any amount you wish. Now since I was putting in enormous amounts of volume at the poker tables, when I ran a filter like this I would get back hundreds and hundreds of hands. But I have always been a big proponent of putting in the hours away from the tables over the years. That is, making time for studying poker. So therefore, I would just set aside an entire afternoon or weekend to go over them all. The easiest way to do that is to select all hands, stick them in the replayer and analyze them one by one. Basically I was looking for any signs of spewy play on my part. That is, hands where I could clearly see a mistake was made on my part that would never happen if I was playing my best. And moreover, I would keep a running tally of all of the money that I wasted because of this which I called my "spew test". 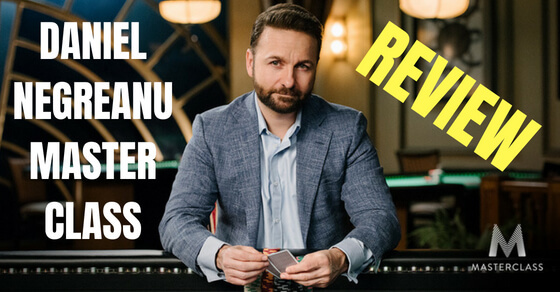 When you actually take the time to sit down and honestly access just how much money you are giving away at the poker tables through poor decision making, it might finally make you start to make a change. It definitely did in my case. And as you can probably already guess, the #1 culprit of all of these mistakes by far, was tilt. Tilt Was Costing me Over $800 Per Month! When I added up all of the mistakes that I was making in these pots I found that I was losing over $800 a month (or 10k a year) mostly due to tilt. 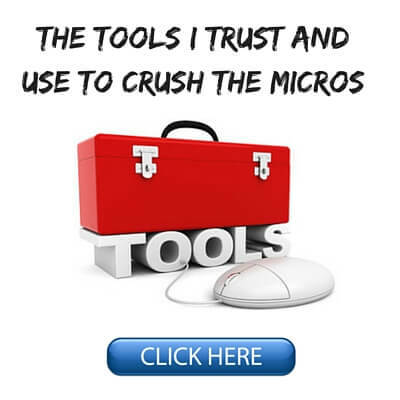 Since I was only making 2k or 3k per month with rakeback added in grinding the micros, this was a very significant loss! This would be like subtracting 25%-50% or even more from your current salary. You would probably be choked. You would tell the boss a thing or two! Perhaps even quit. But in my case as a professional poker player I was actually the one doing it to myself. So I had to make a change. 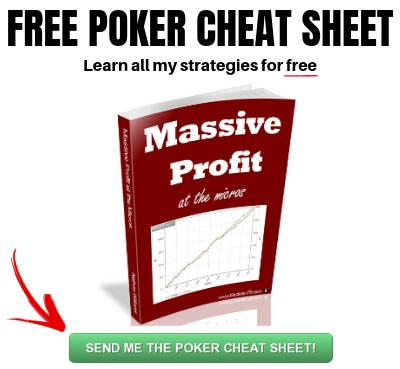 As I have discussed many times on this blog and elsewhere before, tilt is your #1 enemy at the poker tables. It is basically you voluntarily giving your money away to other people because you feel frustrated. This is sheer insanity in any other venture in life but for some reason so many of us poker players simply shrug this off or try to sweep it under the rug. I actually know first hand from having coached over 100 students in the past that tilt is far and away the #1 problem that holds people back in poker. The problem is that as long as you are human and you play this game, you are going to tilt. There is simply no way around it. This is a highly swingy game where sometimes you can make the right decision and still lose again and again for days, weeks or even months in some crazy cases. I don't care how much of an unemotional robot you are, at some point this is going to start getting to you and ultimately affect your play. This is why learning how to quit is so important. 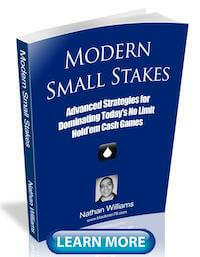 And this is arguably the biggest breakthrough that I ever made in my poker game. I often suggest using a stop loss. This was in fact how I primarily turned this trend around and started recouping much of that $800+ in losses every month. I set a stop loss which means that if I lose a certain amount of buyins then I must quit playing poker for the rest of that day no matter what. But really it is just about recognizing the signs of tilt and being able to get up and walk away from the poker tables before it starts affecting the quality of your decision making in a major way. Now most people who win at poker though have a huge ego (this is actually a good thing in this game). So quitting when you are losing is the last thing that you want to do. I used to play marathon sessions while on tilt chasing my losses all the time. I simply could not accept losing my money to a bunch of donks that hit lucky cards on me. I didn't need to win, I just needed to get even with them! But a few mental shifts in the way that I think about this game (in addition to the stop loss) allowed me to stop this destructive behaviour, accept losses and not spend hours playing my C or D-game just to "get even" with a bunch of dumb fish. The thing about poker is that every time you post the blinds this is really just a continuation of the previous session which was in turn a continuation of the one before that. This is why we wait for the blinds to come around to us each time before playing (or at least you should). Because we are just continuing from where we left off last time. When you learn to see the game in this way, then you will understand that your entire poker career is really just one big long session. These individual wins and losses that our minds create, these "sessions" or "daily results" don't actually exist in reality. They call poker a "grind" for a reason. Because it is a never-ending series of ups and downs. The only thing that really matters is where you stand after a year, a decade or after a lifetime of playing this game. So when you learn to start thinking about the game correctly like this, then you can stop losing your mind about individual wins or losses on a given day, because you know that they ultimately mean nothing. The other important thing to remember is that the games are always running (both online or live) 365 and 24/7. They never stop. This means that you aren't missing out on anything by quitting. Roughly the same ratio of good players and bad players will be sitting there next time, even if some of the faces are different. Therefore, not only is there no reason to "chase your losses" in any individual session but there is also no reason to "get even" with any particular person either. Don't make poker personal. If you consistently apply the right strategy and play with bad players, you will win in the end. That is the bottom line. Everything else is just details. 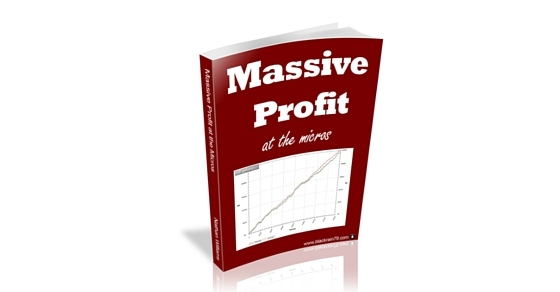 How do you make $800 more per month playing micro stakes poker? Well in my case it was actually quite simple. Stop voluntarily giving my money away so much by making bad calls, terrible bluffs and so on! And the main reason why I was doing all this was because of tilt. More specifically, irrational emotionally charged decision making because I was upset with my current results. But once I learned to start setting and adhering to a stop loss and also seeing the game more in it's true nature as one long term journey, it became easier for me to just walk away on the bad days. This allowed me to stop making so many stupid tilt induced plays and ultimately become a much bigger winner at the poker tables. 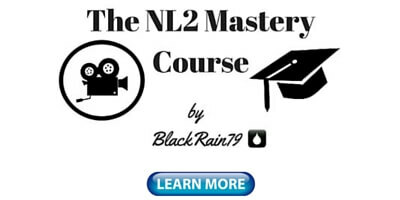 Winning more in poker is not always about getting better technically or increasing your skill. Instead most people could improve their results much faster by focusing on how much they are giving away when the cards go bad for them. And the great thing about doing a "Spew Test" like I suggest above is that it forces you to look at a real number that probably means something to you in your day to day life, like $800. This is like buying a brand new iPhone for some random stranger every month. Tilt can be an expensive habit! This might be enough for you to finally put your foot down and say enough to tilting off so much of your poker winnings. I know it was in my case. 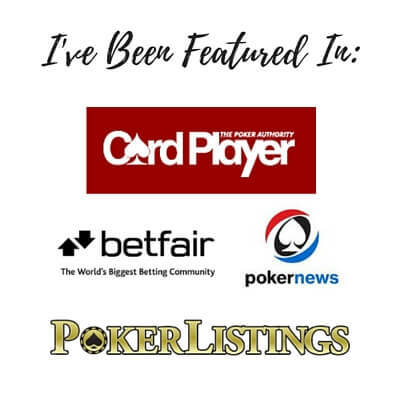 If you want to know about my day to day life as a poker pro traveling the world, make sure to follow me on Instagram. Let me know in the comments below how much tilt and spewy plays affect your poker results. What are you doing to try and stop it from happening? 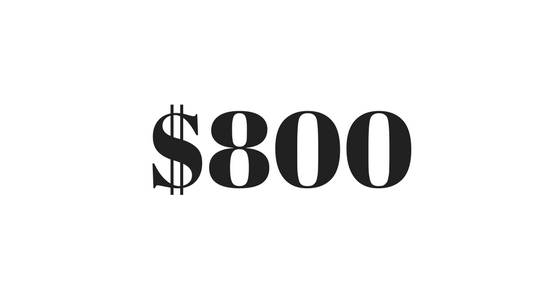 While that number might be $800 a month for you, that does not mean it will be $800 a month for somebody else. The title is a bit misleading because most people will not put in 200k hands a month and thus not tilt that much money away. They might also not play the same stakes. Sure stopping tilt will make you money but having a title state "How to make an extra $800 a month" is just misleading. what i find about tilt is that tournament dont tilt me so much as cash game do. Not sure why people want to argue with you or nit pick you on the title when you are giving out free advice. As always full a good, sound , wise advice. Thanks Todd I try. Definitely wasn't my intention to mislead anyone. 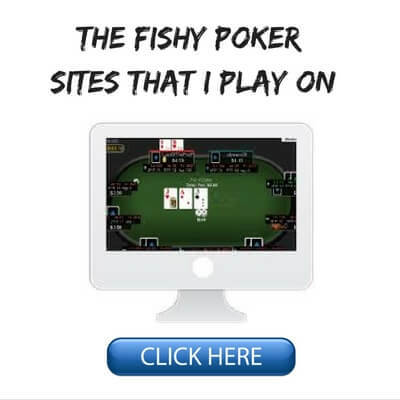 @Cristian This is indeed a cash game blog. I don't know enough about tournies to want to speak on them. I'm not missing the point at all, I think the content is fine and you raise a good point albeit very trivial one. I just think that when I see an email from you on "How to make an extra $800 a month" and your first sentence in that email is "How would you like to make an extra $800 a month playing poker". You'd think that that is what I am about to read. But it isn't, like you said it could well be more or actually as I stated probably for most players a lot less than that. I'm sure you did not want to mislead anybody but that does not mean that your title is not misleading. Great read as always. Thanks for the continual help and advice. Thanks for reading Bryson glad you enjoyed! 100% with you bro! Semi-poker player for years. After a couple of analyse, i realised i can't play too much table and when I play too much table, i tilt. Thanks for the article. Glad it helped thanks for reading Simon. Thank you sir glad I could help! 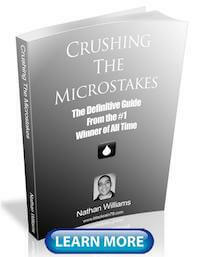 Good read Nathan. How did you know it was tilt? Did you remember the hands or could you just find no logic to the plays that you made (therefore must be tilt)? Chilling in Chang mai as I write this. Got soaked by water guns today! I knew at the time I made those bad plays haha. But the analysis after the fact confirmed that. Cheers man have fun! Happy Thai New Year from Bangkok. Nice advice Nathan might get into that soon since I have a few days off. Decided to try out Spin&Gos on the side just to do something different from time to time. What are your thoughts about those games? So far they seem pretty soft. Take care! See ya! Thanks Jorge. I don't have much experience with Spins but one of my friends is one of the top players on Stars playing these. He tells me that the swings are big but there certainly is an edge to be gained in them. How much I don't know. I know he does well though. ps can you even combine the two ? bb/100 of 11.5 is that right ? P,S, if the above is even correct ? would describe 11.5 as soild ? maybe crushing ? Thanks for another great article Nathan, you always help. Great article. The truth of it really hit home. Thanks for putting out truly helpful information. Thanks William glad I could help! Black rain is absolutely right. Glad this article helped you Michael! Your article is great Nathan. I tilt sometimes too. We all do. But I had one tilt a week ago. Like never before. I was loosing like 4 buy ins on 1 outer and 2 outer all in on turn stuff. And he gets there. Not a bad beat story. Happens. Ok. But then I had KQs and make KKKQQ. YOU KNOW a strong hand. I bet the river. And he raises me. I was doing other thing and playin 6 tables. I tank a little set the amount to All in To shove and misclick and fold my KKKQQ. I was soooo tilted like crazy. Like waiting to take it all and then fold. Closed the poker app instantly and walked away for 3 hours. When i was fine. I was on tilt because it was my mistake. Thanks Daniel glad this article helped you! I started to analyze my game like this back in 2011 because December was a really crappy month and when I added up all the losses which was caused by my stupid plays I was blown away, I lost 1100EUR by stupid calls and allins in one month (I played at 50NL), these were only the 20bb+ pots, I think it counted for 11 bb/100 "error" in that month. The funny thing is when you run bad you make stupid calls because you just can't believe that they have it again. Or you make snap decisions, this is probably my biggest mistake. When you run good you make stupid bluffs because you feel invincible. So the end goal is to minimize these losses as much as possible. These worth much more than a new exotic starting hand chart or postflop strategy. I haven't counted my mistakes this month but my rough estimate is between 150-200 USD and I play NL10/16 now, this is a restart after a year so again, so far it's already more than 10 buyins which is insane. Great article, I'm definitely applying your advices in my game. I'm loving your blog. Thanks you glad my blog helps!